Gaye Gronlund is an early childhood education consultant from Indianapolis. A former preschool, kindergarten, and primary- school teacher in regular and special education, she now works with schools and programs around the country helping them implement developmentally appropriate curricular practices and authentic assessment procedures. She has a master's degree in human development from Pacific Oaks College, with a specialization in early childhood education and teaching adults. An innovative method to accurately document children's growth and development by observing them in the midst of their everyday activities. 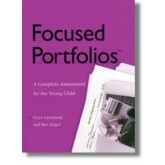 Includes a complete introduction to the Focused Portfolio method, many step-by-step examples and all the necessary forms for portfolio collection.